This two bedroom has one of the very best views in Wailea with a 180 degree panoramic view of the ocean including three islands, the West Maui Mountains, and the 10th fairway of the Wailea Old Blue golf course. The interior has been completely redone and has a new king bed and linens. Features include: central air conditioning, fans in every room, flat screen TV, TVs in both bedrooms, cable TV, DVD player, Wi-Fi, classical and Hawaiian music collection, central stereo with speakers in every room and on the Lanai. DISCLOSURE: Owners of Wailea Ekolu #910 are licensed real estate agents in the State of Hawaii. .
We have lived on Maui and in Wailea since 1978 and we lived in Ekolu the first 39 years and in this unit from 2001 to 2008. We currently live in another area of Wailea. We both grew up in Central New York in the Finger Lakes Region near Ithaca. We have one daughter who lives in the East Bay area near San Francisco. The comfort and upkeep of the unit and the views, views views! The landscape around the property has almost everything you could imagine being in Hawaii. Read the reviews of our prior guests. Unbelievable views of the ocean West Maui and surrounding islands of Lanai, Molokini, and Kahoolawe, Watch whales across miles of ocean. Some children's beach toys like pails and shovels and a few inflatable rings. 1 adult boogie board and 1 children's boogie board. 1 skim board. Owner is not liable for use of any. This would be the sixth time our family has been to Maui. The five times previous we have stayed at a resort on the beach. Well I can now tell you after staying at this unit those days have come to an end! We have stayed in condos around the world and this one is #1 by far. It’s not very often that the actual unit is better than the pictures and description, this one is. Kathy was great and we can’t thank them enough. Looking forward to coming back again. Thank you for a memorable Christmas! We were two couples sharing the condo and we really enjoyed ourselves. The location was great. It was a short drive to restaurants and shopping (although we could have walked). The view was absolutely amazing. The beds were comfortable. We never cooked but I believe the kitchen was well equipped. We had a few minor issues that were fixed immediately with a quick text to the owners. Wailea seemed to be less touristy than Kihei but a fairly short drive to anything you want to do. Enjoy your stay! 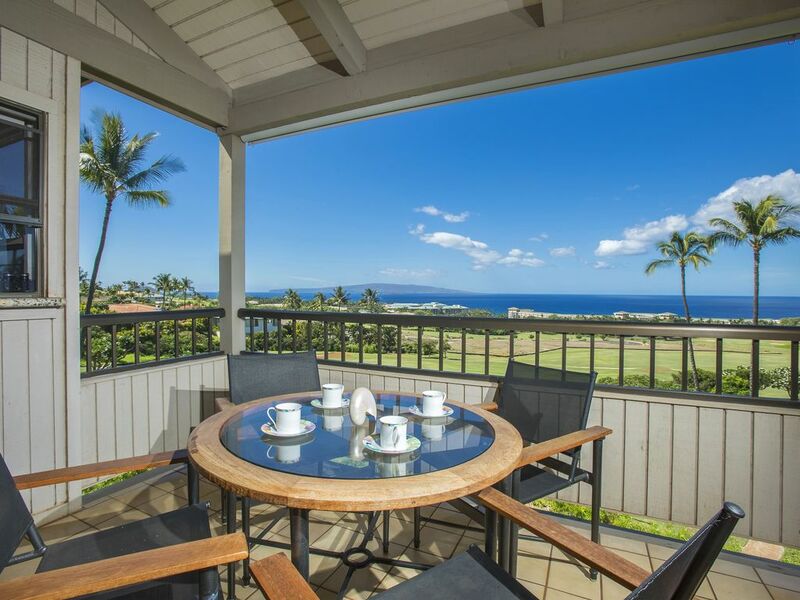 Incredible views from the lanai are only part of what makes this property great! My wife and I are great fans of Maui and over the years have stayed in many properties on this beautiful island. Having a view is always important to us and when we opened up the door to this condo we were awestruck by the expansive vistas with shades of blue from the ocean and sky. The photos we had seen didn't do justice to the unobstructed view which was almost 180 degrees looking toward the ocean. Starting the day on the lanai with coffee and later watching the spectacular sunsets was one of my favorite memories from staying here. The view upstages everything but the inside of the condo was great too! Master bedroom with its own bathroom, washer/dryer, and great views from the king sized bed! A well equipped kitchen was appreciated as we prepared and ate almost all our meals here. There is a dishwasher but the view from the kitchen sink made me volunteer for kitchen clean up! Dining area and living room shared the wall of windows with the great views. Everything was well kept and clean. Liked the comfy couch and assortment of guide books to go through. Nice to have a decent sized wall mounted TV with a DVD player. We brought some movies to watch and plugged in our underwater camera to see the highlights of our days adventures. Great fun! We took advantage of the properties community pool and the BBQ grill which were so handy to access. Everything here is so lush and green! The care taken to keep everything neat and trim is impressive! Like staying at one of the expensive resorts without breaking the bank! More often than not we swam and snorkeled at beaches that were about a ten minute drive or less. Love the public beach facilities on Maui! Walked the Wailea beach path a few times which was great exercise with a view. The shopping center in Wailea has all the things we needed and we became big fans of The Market store there. Great assortment of food and drink! Malasadas at the check out counter! Owners, Jim and Kathy helped us find a great spot for enjoying ukulele, food, and Aloha spirit at the Surfside Deli in Kihei! My wife brought along her favorite uke to play with the locals on Friday night. Great fun watching, listening and singing along! Even joined in a hula with our new friends! Being in Maui has always been special to us and this trip only disappointed by being too short! Appreciate being able to stay at Jim and Kathy's great condo. The memories and photos we have of our stay will have us planning a return visit soon! Aloha! The view from the lanai is absolutely unbelievable!! You’ll spend most of your time out there !!!!!! This condo is wonderful and has everything you’ll need!! The beds are just amazing too and the washer and dryer helped us be able to pack light. We cooked breakfast and several dinners in the condo and enjoyed dining on the lanai ! Food is quite expensive in Maui so be prepared!! We LOVED morning coffee on the lanai and watch the island wake up. This is a very quiet area and we loved the peacefulness. The pool is just a few steps out the door and down the sidewalk! The only thing I would change was the time of year we visited. We were there Sept 18-25, 2018. I didn’t realize this was the hottest time we could have visited. High temps, high humidity.... really hot!! Do your research..... thoroughly!! You can’t go wrong with this condo.... it was a dream come true!! The owners were delightful, friendly and very easy to work with which I greatly appreciated. They really wanted us to have a great time.......and we did!!!😍�. I would definitely return to this condo one day!!! Great views and great owners! We just got back from our 4th trip to HI, our 3rd to Maui exclusively and our 1st at this condo. Undoubtedly the best view we've ever had, and the owner, Kathy, was super attentive to our needs. Even made sure we had muffin tins for the kitchen and a cooler to take to the beach (per my request), and brought us extra fans for the hotter than we were expecting September weather. We were expecting Hurricane Olivia towards the end of our trip, and she kept us posted to make sure we were comfortable and had anything we might need. Turned out, in Wailea we only felt like we were occasionally being spit upon by Olivia, but it was great to know she was so close and thinking about us. Condo is well stocked with all the beach supplies you need, towels, chairs, umbrellas, boogie boards and she even brought us some extra snorkeling equipment. Kitchen is well stocked for cooking as well. My favorite part was the coffee on the lanai, and watching the sun set from the lanai. We'll definitely be looking this condo up again if we get to return! If it's your first time to Maui, and looking for relatively cheap eats like we were, Maui Fish n' Chips in Kihei was great, reminded us of a place we went to on our first trip called Alexanders, which is gone. Also, Lahaina Luna Cafe in Lahaina...amazing tacos. Thanks, Kathy, for being such a great host! What a lovely review! We have been so fortunate to get such great guests. We're always happy when we hear how happy people have been and in this case, in spite of the threat of a hurricane/tropical storm. Wailea is such a great location and yet again, we did not experience anything from the storm. These guests left the place so clean! I'm sure our team of cleaners really appreciated the Aloha Spirit they were shown by this family. Come again! All rentals are subject to Hawaii State Tax of 13.416%. Stays shorter than 6 days are possible especially on short notice if we have availability. Stays less than 6 days are subject to $100 cleaning fee.